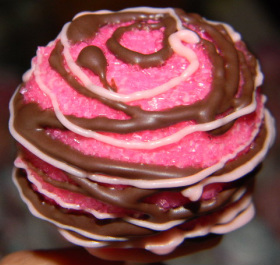 If you would like to make your Cake Pops extra special and would like to add something from the Toppings and/or Flavor section please email me with your request and pay the difference for your order on the Shipping Payment page, you can also pay for shipping on that page if you intend on having them shipped. Thank you for your order and I hope you enjoy! The Cake Poppery is a family owned business serving the Maryland area. This bakery specializes in Cake Pops, which are balls of cake combined with frosting and then coated in your choice of coating! These delightful treats are made from scratch and with fine ingredients. They are moist and decadent! We offer many different flavors, designs and toppings to make them the perfect combination that you will enjoy! ...or just a special treat for yourself to enjoy!